Download "Screen shot 2013-01-07 at(...).png"
Verraest, Sofie, Bart Keunen, and Katrien Bollen, eds. 2012. “New Work on Landscape and Its Narration.” Clcweb (edmonton). Purdue University Press. Verraest, S., Keunen, B., & Bollen, K. (Eds.). (2012). New work on landscape and its narration. CLCWEB (EDMONTON). Purdue University Press. Verraest S, Keunen B, Bollen K, editors. New work on landscape and its narration. CLCWEB (EDMONTON). Purdue University Press; 2012. Verraest, Sofie, Bart Keunen, and Katrien Bollen, eds. 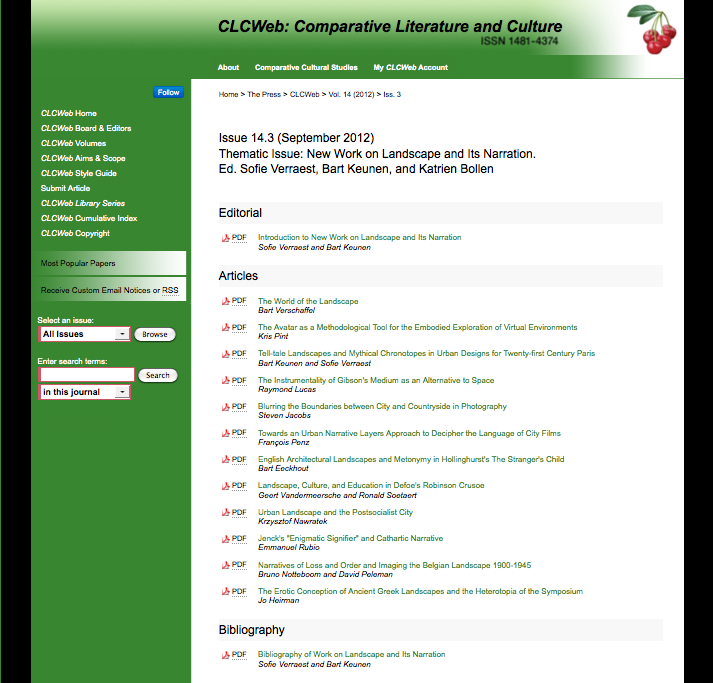 “New Work on Landscape and Its Narration.” CLCWEB (EDMONTON) 2012 : n. pag. Print.